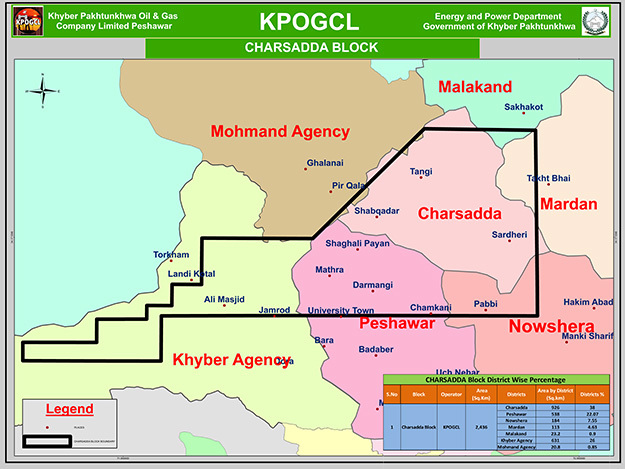 Charsadda Block - KPOGCL - Oil And Gas Company Ltd.
Charsadda Exploration Block having an area of 2,436 Sq. km, Block is located in Charsadda (38%), Peshawar (22.07%), Nowshera (7.55%), Mardan (4.63%) and Malakand (0.9%) Districts of Khyber Pakhtunkhwa Province and Khyber Agency (26%), Mohmand Agency (0.85) of FATA Pakistan. The Block lies in Prospectivity Zone-I. Based on surrounding discoveries in Kohat Basin i.e. Chanda, Mela, Nashpa, Makori, Maramzai and Mamikhel, the Charsadda Block is considered to be prospective. The Block is located about in the vicinity of Peshawar City towards North and 300 km North West from Islamabad. It can be easily approachable by a network of highways and metaled roads from Districts Peshawar, Charsadda, Mardan, Nowshera where modern facilities are available.